Grayson & Company was founded in 1883 in Moose Jaw, Saskatchewan by William Grayson. 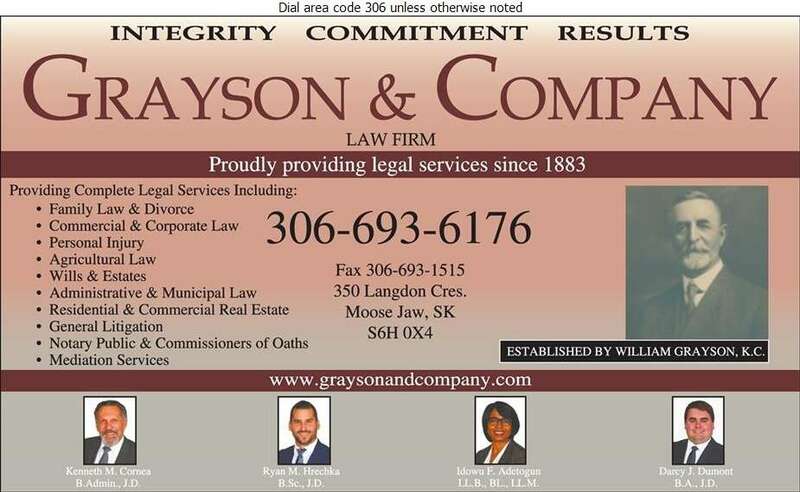 Today, Grayson & Company employs 5 full-time partners,1 associate and 2 in-house counsel with law offices located in Moose Jaw and Central Butte. Our law firm provides a full range of legal services such as family law, divorce, wills, estates, residential and commercial real estate. Our lawyers are able to converse with clients in both official languages. When in need of legal advice, please contact our office. To view our broad range of legal services, visit our website.